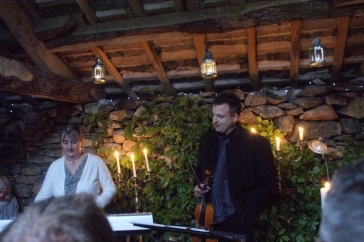 Our next full concert gig is a return visit to Lucy's Barn near Ullswater. Saturday 25th May 2019 at 7.00pm. See their website for details here and come and join us! 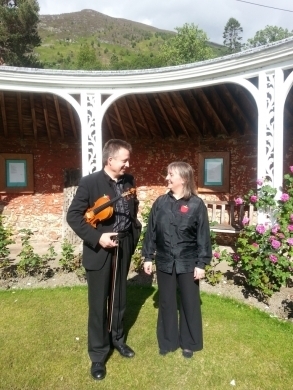 and Ian Wright (fiddle/vocals) have performed together as Fain since 2003, appearing in Carlisle Cathedral, Lanercost Festival, the Zagare Cherry Festival in Lithuania, the Ireby Folk Festival, the Edinburgh Fringe, Cockermouth Live, and many other events including dinners, weddings, garden parties. We've even performed on a train and on a boat! – a quite moving and totally beautiful concert!" "...absolutely superb – both are exceedingly talented musicians, who obviously love music. We could have listened to them all night..."
"...Ian Wright playing the violin with great dexterity and talent, accompanying Anne-Marie Kerr who sang Scottish and Irish ballads with heart-rending clarity and sensitivity..."
traditional Scots, Irish and Breton dance tunes, airs and melodies by the Irish harper O'Carolan. songs in Irish, Scots, Gaelic, French, Russian, Czech - and of course English. ballads, lullabies, love songs, laments, waulking songs, mouth music and songs by Robert Burns. Traditional Cumbrian tunes and dances. 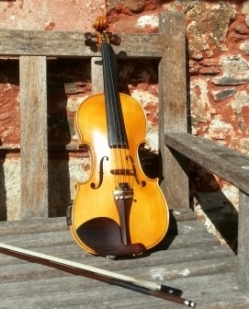 We also specialise in items from the Classical repertoire for various combinations of violin, voice and piano. We welcome bookings, whether for a 10-minute spot or a full 90-minute concert.